It’s the Japan Crate Valentine’s Day edition! Included in our booklet this month is a description of each snack, which is super helpful if you don’t read Japanese. I have had these cute puffy stars in a few different flavors and I always enjoy them. They have a nice sweet strawberry flavor and a soft crunch that I really enjoy. They aren’t too crunchy or too sweet, which always leads to the bag disappearing quickly! This salty rice snack was ok, nothing too exciting happening here. They make a nice savory afternoon snack and the crunchy texture is very satisfying. They mainly just tasted salty to me. This little foil wrapped heart reminded me very much of similar Valentine’s Day treats here in the States. It was good, rich milk chocolate. This reminded me so much of a Crunch bar! It had the same delicious milk chocolate and puffed rice bits. These popular Japanese snacks come in a ton of different flavors. This one is just chocolate over the semi-salty crunchy corn base. I find this snack to be a little dry, but it does have a mix of sweet and salty, which is always winning! This sub always sends along a fun little kit! This month it is a set of super soft banana candies you can put on a stick and dip into chocolate and then sprinkles. I love banana candies so this was a treat for me! The soft candies with the milk chocolate and crunchy sprinkles were really delicious. This was a bigger bag filled with individually wrapped candies. The candies themselves were domed shapes, milk chocolate, and filled with a very rich strawberry filling. They were a little too rich for me, but my husband loved them! These were essentially M&Ms but in better colors and much cuter packaging! The little triangle package was the perfect amount for on the go snacking, and the crispy little shells were just the crunch these milk chocolate drops needed. I always think it’s so funny to send a single piece of gum, because here in the states we never buy gum one piece at a time, unless it is out of a gumball machine. The flavor of this gum was a yummy soda, and who doesn’t love Rilakkuma? This was another chocolate covered semi-salty corn snack. I don’t mind them, but they can be very dry, and compared to many other snacks this month, a little boring. I couldn’t find this exact flavor for sale, but I did link to a bunch of different flavors in the same size bag! These were really interesting. 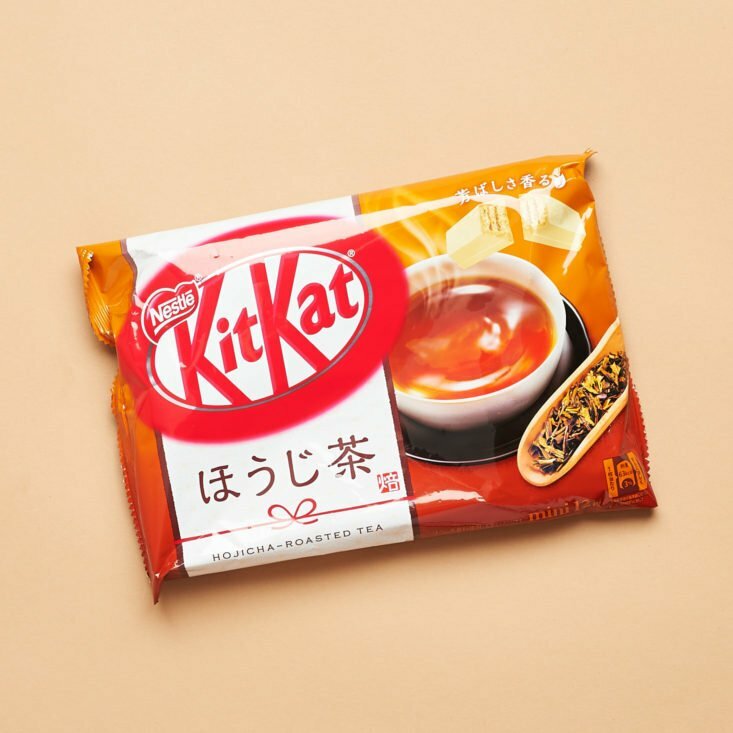 They were a familiar KitKat candy but with a tea flavor that was really fragrant and delicious! Yay for banana candies! These chewy little guys were filled with chocolate and bursting with banana flavor. I also really think the little bird on the box is adorable. This was like a Japanese version of Fruit by the Foot, but so much better! It did have less length, but the grape flavor was amazing, and I loved the smooth gel-like texture. These were almost exactly like the M&M like candies from above. They were tasty, so I didn’t mind. The floral packaging made them seem really festive for spring. Of course I loved this adorable Hello Kitty lollipop, with its pretty packaging and cute color. I could have used a whole bag of these! The candy was light and sugary, with a perfect berry flavor. These little pies reminded me very much of Moon Pies, but smaller. They are light and fluffy, and I loved the strawberry flavor and marshmallow filling. These little chocolate and strawberries cones really hit the cute factor out of the pack, even down to the packaging! I loved these little morsels because they were a fun shape and the perfect mix of fruit and chocolate. I didn’t like this drink, but I don’t enjoy things like chocolate milk or hot chocolate. It tasted a little watery to me. The size of the can was perfect for a little on the go sip, I just wish it had been fruity or fizzy. The Verdict: Japan Crate always has such fun treats! This month was filled with berries and chocolate, a fitting nod to Valentine’s Day. It also had some banana treats which I always enjoy. I think they send some really cool DIY kits and the banana chocolate one this month was absolutely a favorite. The tea-flavored KitKats were also super neat to try, and I like that they sent enough of them for me to share. The drink this month was a dud for me, but I imagine that is likely because I don’t enjoy similar types of drinks. All in all, this month was a lot of fun and had a great variety! If you like hard to find and rare Japanese candies, and lots of them, this is a box you should totally try! What did you think of the February Premium Box by Japan Crate? Megan, are you the reviewer for the other Japanese snack boxes as well? Our family would like to try one, but I am feeling a bit overwhelmed by the choices. Need something that is big enough for a family of 6 sample, but not so expensive that it breaks the bank. This is super helpful! Thanks Nicole! What about Tokyo Treat compared with Japan Crate? These two are very similar and I want to know how they rank against each other.